CDs are a lot more convenient, and they make great gifts. 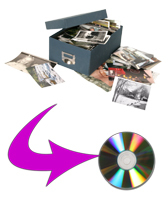 Now you can turn a lifetime of photos into a convenient disk, and make extra copies for all the children and grandchildren, brothers and sisters. Click here to download an order form to start your shoebox scanning order today.